When I started dating my future husband, his children were seven, five, four, four, and 2 ¾. I had met each of the kids maybe once or twice when I found myself in line to see Santa at the Nordstrom flagship in downtown Seattle. Now, if you live in a city with kids, you totally know the chaos of waiting in line to see Santa at a department store. It takes forever. Forever. Like best ride at Disneyland forever. And here I was in a new relationship with a man with five children under the age of eight waiting to see Santa. It was a bit surreal. Years ago, my friend Sharon shared several of her family Christmas traditions that I thought were just genius. My favorite was her story-a-day tradition. As she packed up Christmas decorations after the holidays, Sharon would wrap all of the kids’ Christmas books in leftover paper. The wrapped books were pulled out at the beginning of the following December and her kids opened one book per day to read together before bedtime. Brilliant. Wrapping things the kids already owned? Reading a Christmas story together at the end of the day? What’s not to like? For the last several years (read: since we got married), my husband has been trying to get me to tone down the Christmas gifts. I try, really, I do. But sometimes I forget what I’ve already bought then feel like I have to “make it even”. Sometimes it isn’t even me that makes the tree look like Santa has dropped his entire toy load in our living room. It’s simply the fact that we have seven kids and they have five grandparents on our side of the family alone plus cousins and aunts and uncles and godparents. It isn’t much different than when I was growing up. Lots of kids equals lots of gifts, even if you personally don’t buy a whole lot. 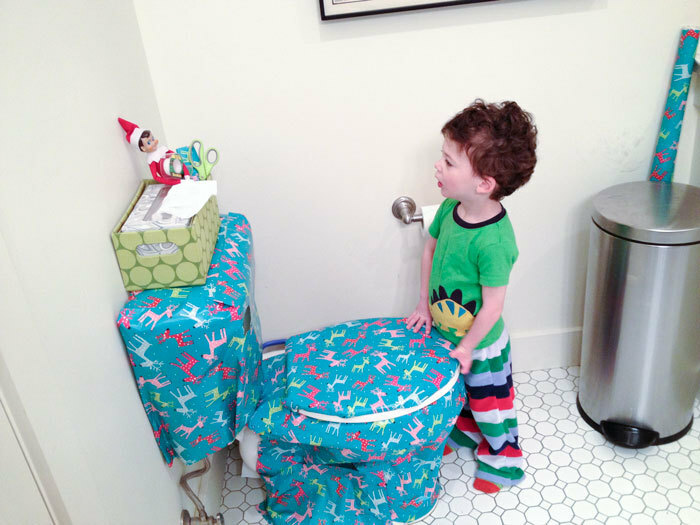 The Elf on a Shelf is everywhere these days. It makes me kind of sad to see all of the products on which our elf’s face have been plastered. My kids, of course, think it is the coolest thing ever. “Look, Mom! I just saw Felix!” I still love our elf. I’m thrilled to introduce you to Felix Navidad. I am kind of obsessed with advent calendars. Advent is by far my favorite time of year. For me, advent is about slowing down and spending time with family. Wait, what? Did she actually just say that? Yes, I did. I wasn’t always this way. I spent many years missing the whole season, stressed with all the things that I “needed” to get done. The shopping, the mailing, the lists. I have seven kids. I get a lot of questions about that, especially during the holidays. Most people want to know how I can possibly get all the shopping done. I start early. But there is another reason that I start early. I love Christmas. But five or six years ago, I had begun to dread Christmas. It was all about the presents. It was all about everyone else’s schedule and agenda. It didn’t look anything like the Christmas that I grew up with. I really loved that Christmas. Yesterday, we talked about advent in our house. The same year that we began daily activities during the Christmas season, we also adopted an elf. Our elf’s name is Felix Navidad. Felix caused a little bit of trouble last year. He turned the milk green. So far this year, Felix has been far more tame. He left a note and a puzzle on his first day home. He played hungry hippos with Ariel and Eric, went for a ride in the car and traveled in a backpack to New York. I suspect he has some tricks up his sleeve for the remainder of the month. I'll keep you posted on instagram. What’s your elf’s name? Is he tricky or calm? Does your elf want to come over for a play date? Sunday was the first official day of advent, but I have been preparing for the season of preparation for at least the last month. I know, I know. Put the list down. I plan to do just that during advent, at least I am going to try. Christmas has always been my favorite time of year. As a kid, we spent Christmas at my grandparents’ house in Louisiana. My grandmother would deck out the house from top to bottom. She changed out pictures on the wall, hung garland on the stairs and the front porch, and had a tree that reached the top of the ceiling. We would turn on the air conditioning, light the fire, and crank up Johnny Mathis. What I did not realize until I married and had five step-kids was how much work went into Christmas every year. I remember presents stashed all over my grandparents’ house…I never thought about how much time my grandmother spent shopping and cooking and decorating. With seven kids and sixteen grandchildren, she must have started in January just to get it all done. And my mom somehow packed for the family to travel across the country while making sure that my brother and I never saw a gift prior to Christmas. Fast forward twenty years and the list started to get the better of me. We didn’t make cookies or enjoy the lights or build gingerbread houses. I didn’t enjoy putting up the tree. It all just became a chore. So after years of complaining about it, I decided to incorporate fun into every day of advent. I know what you are thinking. More work? Longer list? Yes. But I forced myself to do the work before December 1 so that we could enjoy the season of preparation rather than spend it shopping. Amazingly enough, it worked. The girls and I made an advent calendar with an activity for each day. We also made one for my aunt’s family in Maine. Our activities were very simple and included certain things that we were planning to do anyway like decorating the tree and watching Charlie Brown. Some days, we forgot to check the calendar. But for the most part, I enjoyed the season more than I had in a long time. And the kids enjoyed making a package of activities for their cousins. We started to put giving back into our Christmas. We started to re-focus on the fun of the season. This year, I was lucky enough to share our advent tradition with our church. I helped a group of amazing women make forty advent calendars for families in our parish. The response has been so positive that we are hoping to make more for next year. 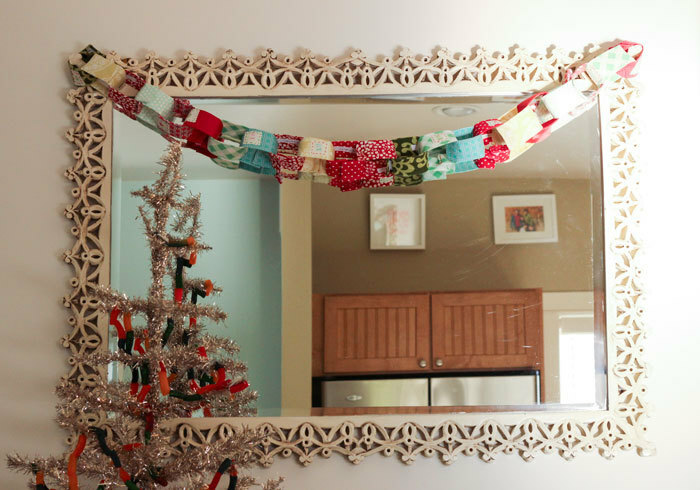 It’s not too late to make your own advent calendar. Try a paper chain or envelopes. You can even put activities on strips of paper in a jar. It doesn’t have to be a complicated calendar. The most important thing is to enjoy the season of preparation. Do something silly together. Start a new tradition. Make something. To get you started, here are the activities we used for the St. Thomas calendars. 1. Start a new tradition. 2. Decorate your windows with snowflakes. 3. Collect food for the foodbank. 4. Learn a new Christmas carol. 5. Read a Christmas story. 6. Pass out candy canes. 7. Take a family photo. 8. Read about St. Nick. 11. Ask someone older about Christmas when they were young. 12. Tell 10 people "Merry Christmas." 13. Watch a favorite Christmas movie (preferably in your Christmas pj's). 14. Shop for a family in need. 16. Drink hot cocoa with at least one meal. 18. Make gifts for friends, teachers, or neighbors. 19. Find the best Christmas lights. 20. Camp out in your living room (preferably under the tree). 21. Play in the snow. 22. Tell someone you love "thank you." 23. Bake cookies for Santa. 24. Sing carols of joy!